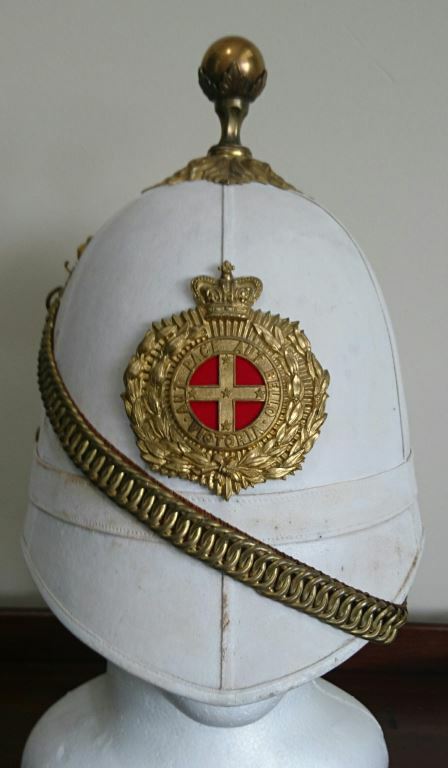 An extremely rare Shako to the 88th Connaught Rangers circa 1825. This has not been an easy Shako to research, however it does carry certain features which are consistent with the changes in 1822. Bell top in appearance being approx. 7 ½ inches in height with a lacquered top of 11 inches in diameter. 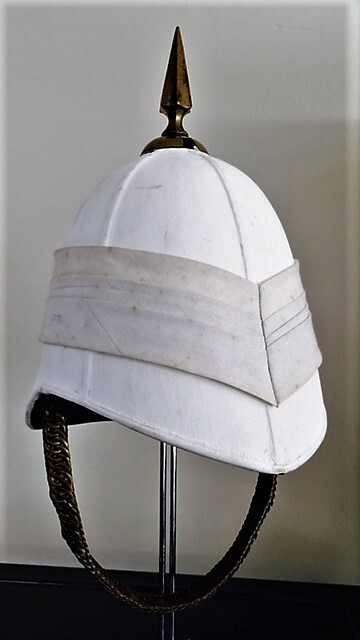 There are no reinforcing bands to the sides of the helmet which were introduced in 1829. 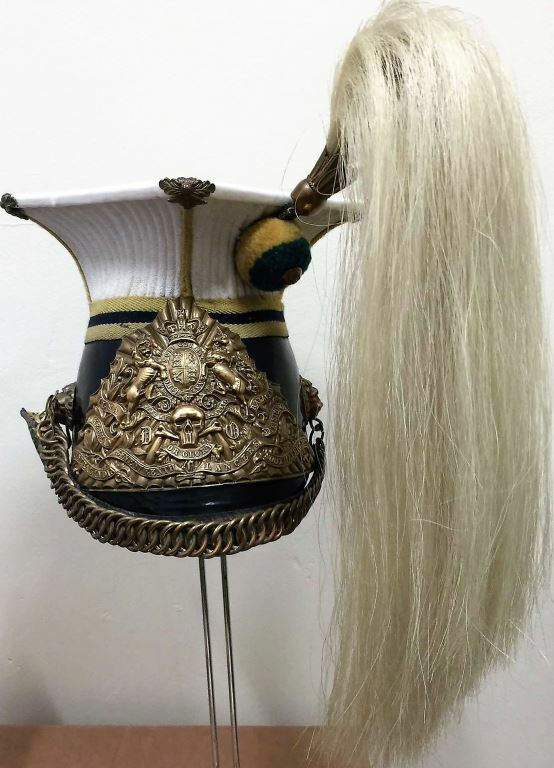 I believe that this helmet is probably an UNDRESS SHAKO often worn with the dark blue frock coat and has no chin strap or provision for a plume. The helmet plate is of the early style with wire fittings as opposed to lugs. The remaining green enamel has been reinforced with a clear lacquer to help hold it in place. The serious badge collectors I have spoken to believe the plate could be unique and have been unable to date it to a specific period. 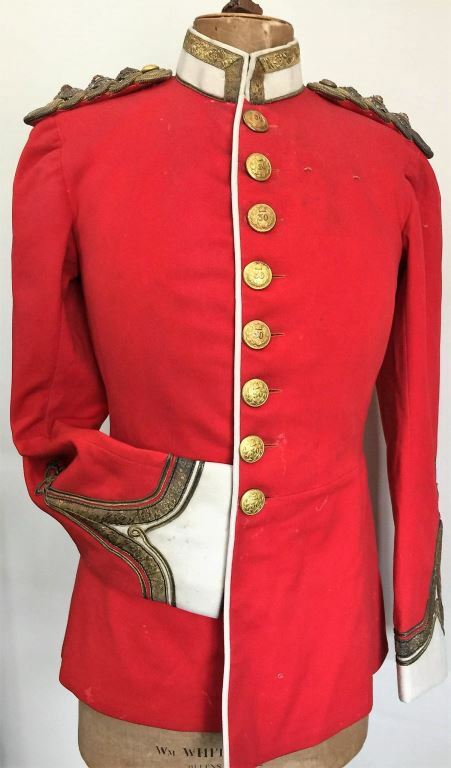 There is no doubt that this is a very rare example to a popular Regiment in overall great condition apart from a few breaks in the leather lining. There appears to be very few surviving undress shakos to any units that appear on the market. 17th (Duke of Cambridge’s Own) Lancers Officer’s Full Dress Schapska c.1912. 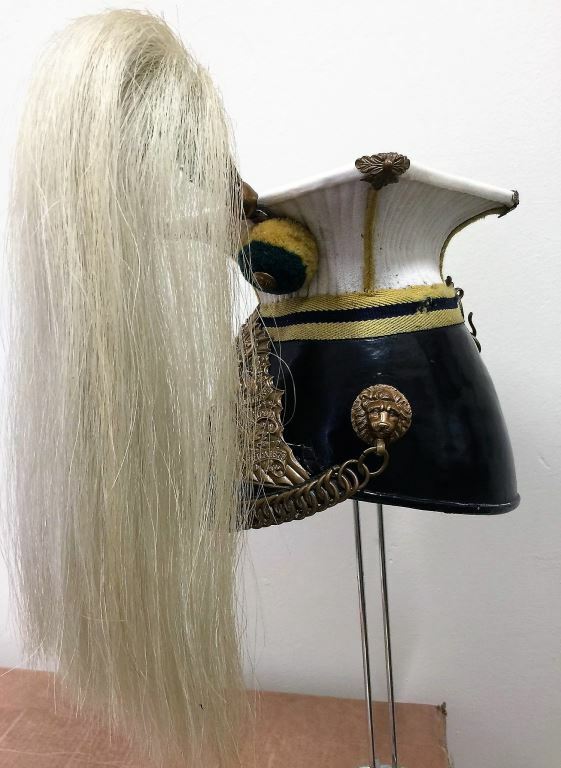 A fine quality example, the black patent leather skull complete with all gold lace braiding, white cloth covered sides and trencher top, the top with crossed gold orris cord, the very fine frontal plate in gilt with silver overlays (uncleaned) these include ‘Seventeenth Lancers’ regimental title and battle honours to ‘South Africa 1900-02’, gold wire rosette with ‘GR’ cypher on blue velvet, correct pattern side ornaments and lined chin chain, correct white horse hair plume with good gilt officers plume holder, wide buff leather sweat band is in very good condition but minus silk attached lining. 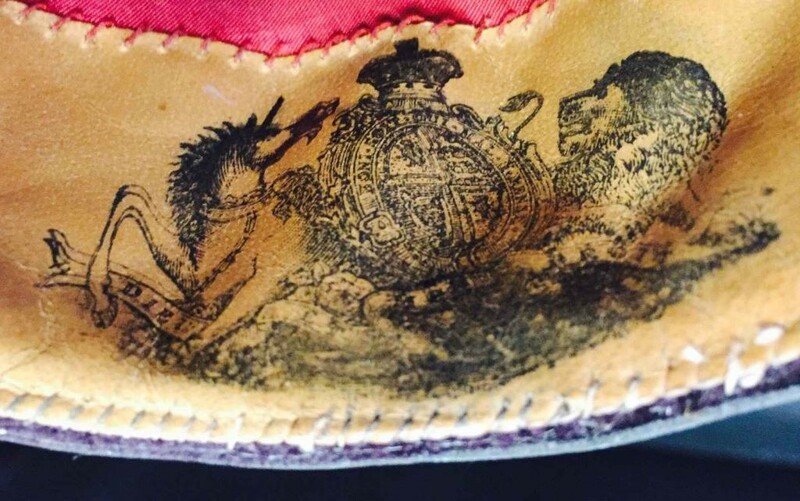 Silk lining to inside crown of mortar board shows maker in gilt as Hamburger, Rogers & Co.
An extremely rare Australian White cloth helmet attributed to (Lt. Colonel) Sir Frederick Thomas Sargood of the State of Victoria Local Forces circa 1875. Six panel body with an unusual four large pleat puggaree. Good leather sweatband with a good silk attachment liner. Great maker’s label "made in England for A.BOWLEY & Co, Melbourne", leaving no doubt as to the Australian provenance. Complete with named carry tin. Note: Major F.T. Sargood entered the Volunteer Force in 1859 finally attaining the rank of Lieut. Colonel. He was elected to the Victorian Legislative Council as the member for South Yarra in 1874. In 1883 he was Minister for Defence and received the CMG in 1884. He was knighted KCMG in 1890. In 1901 was elected member of the Commonwealth Senate and died 1903. 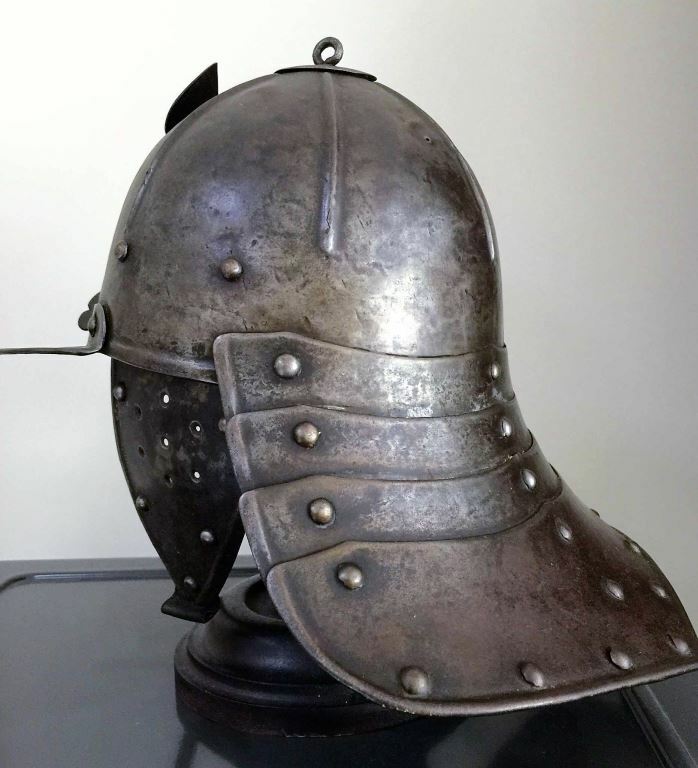 This is an exceptionally rare helmet with the rank of Major on the carry tin indicating a very early helmet. 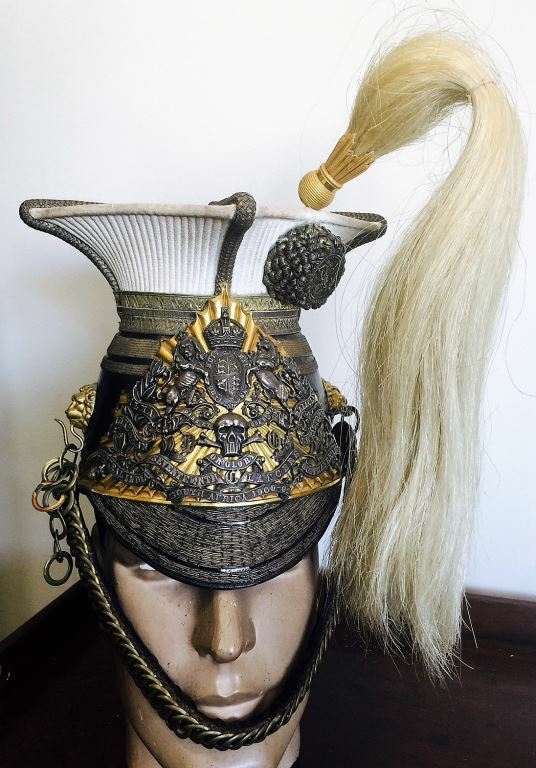 A scarce 1871 Pattern British Cavalry Helmet of the 1st (Royal) Dragoons. Regulation form with nickel skull and brass fittings including helmet plate and chin chain. Leather liner is in good condition. 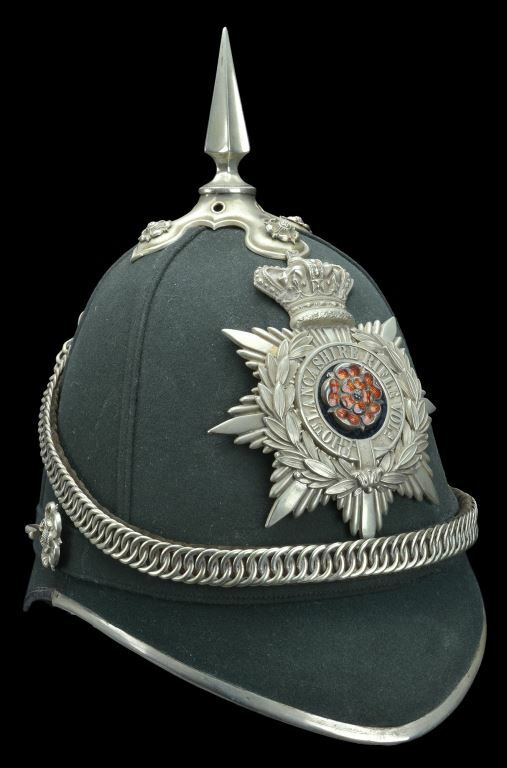 The nickel Dragoon helmets are much rarer than the 7 Dragoon Guards Regiments who wore brass helmets. 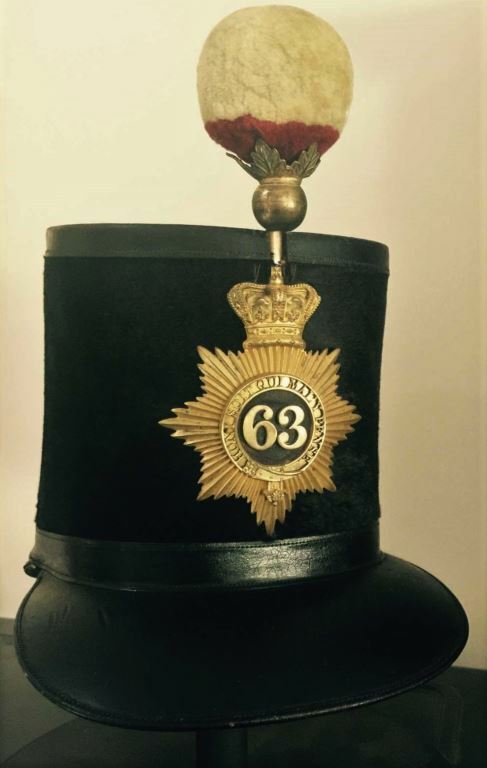 The 63rd (West Suffolk) Regiment Officers 1855 Pattern Shako, an extremely fine and rare example, the black beaver covered body with sunken patent leather top similar bottom bracing band and front and rear peaks, correct bronze gorgon’s head at the back for ventilation. Broken and incomplete leather chin strap but with very good leather sweatband and silk attached liner. Good frontal plate correct and original to the helmet. Plume holder although original is not of the 1855 pattern but correct wool ball. 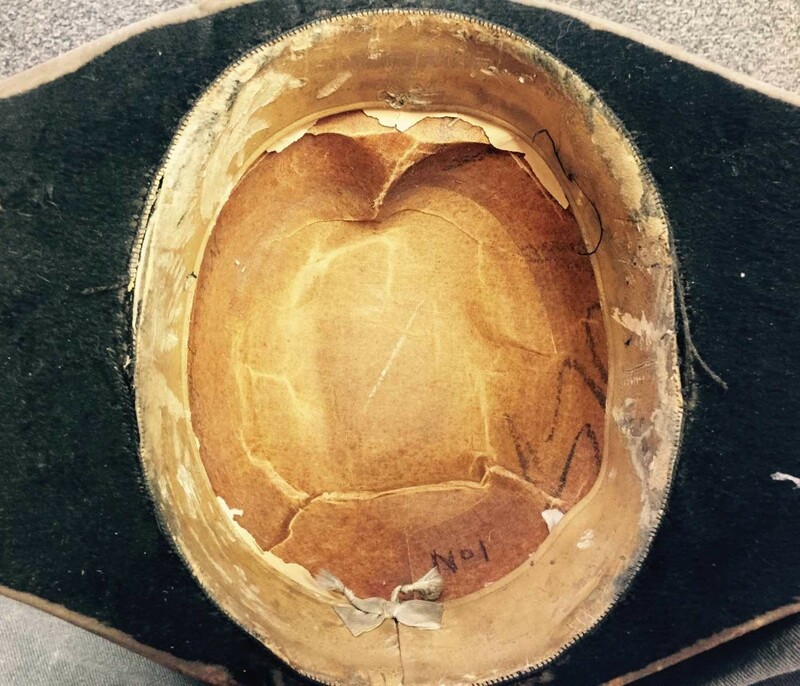 The helmet is in excellent condition with very good beaver body. 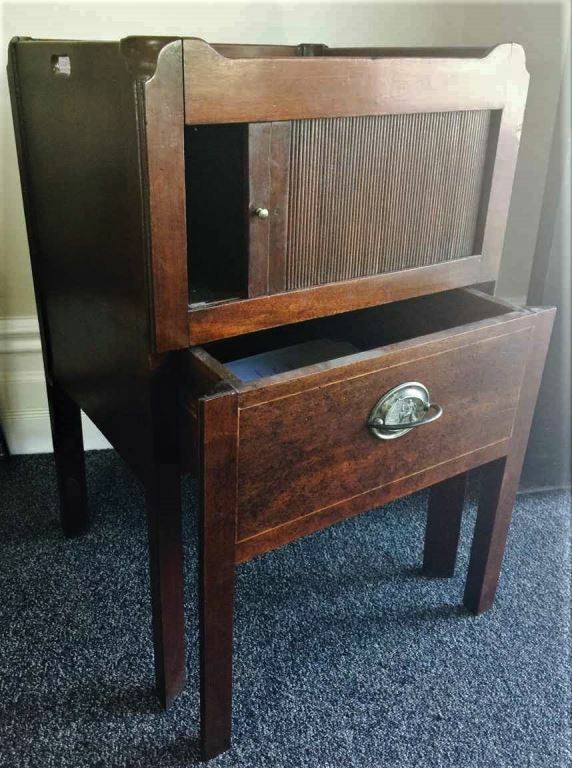 A late 18th Century George 111 Commode which has been converted to a bedside cabinet or small writing desk. The significance of this piece is that it was formally the property of Lord Birdwood (Field-Marshall the Lord William Birdwood, GCB, GCSI, GCMG, GCVO, CIE, DSO. Barron Birdwood of Anzac and of Totnes). Lord Birdwood had family in Western Australia and the grand-daughter sold a number of his personal effects in a Gregson’s Auction in 1991. Galleried top with cut out handles. 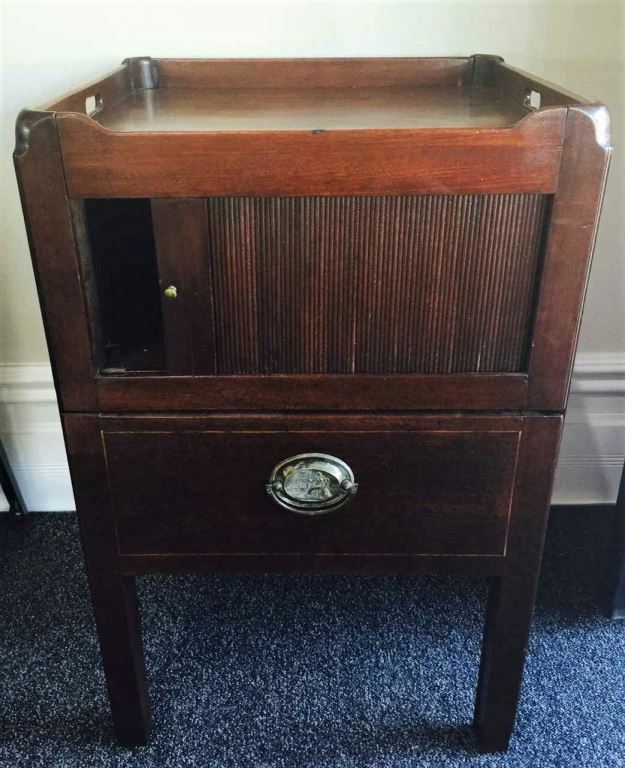 Tambour front and in the Chippendale style. Comes complete with Auctioneers letter of provenance and some research. It was even suggested that this item went ashore at Gallipoli among Birdwood’s smaller items of creature comfort. 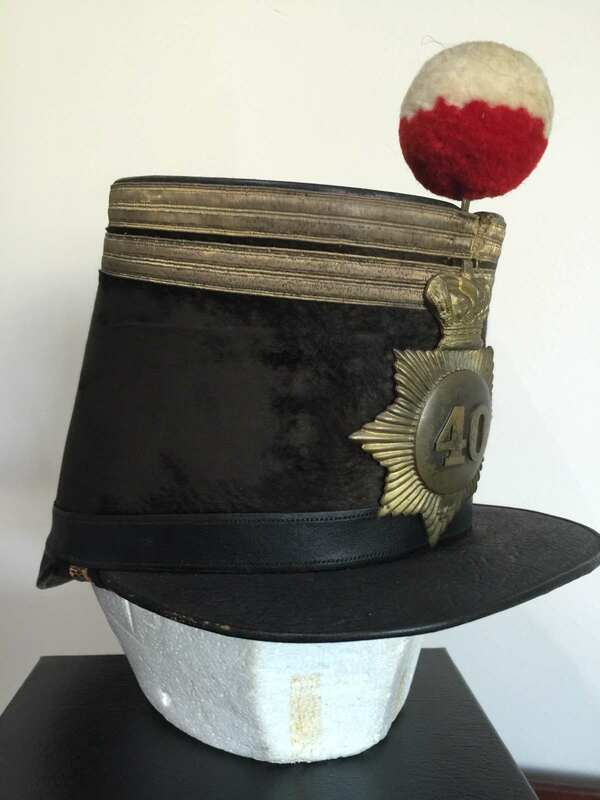 An extremely rare 1855 Pattern Shako to the 40th Foot. 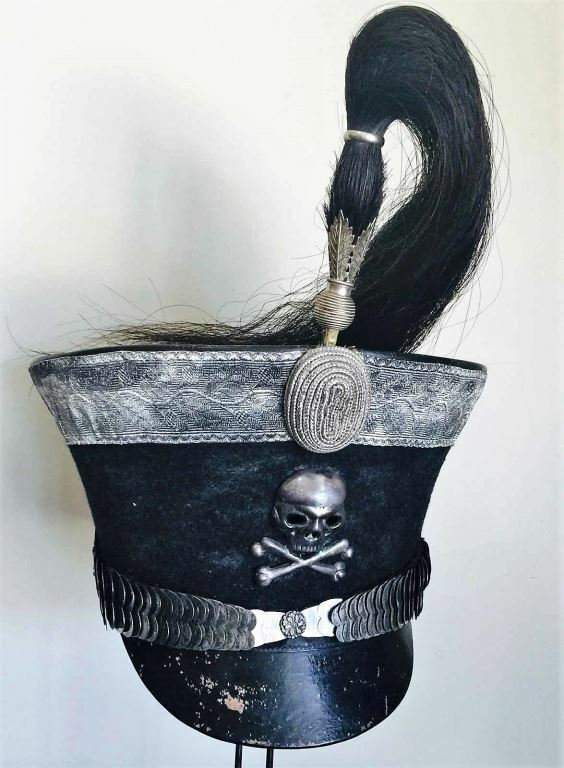 Actual Shako is true to pattern with front and back peaks with gorgon’s head at the back for ventilation. Officers lining in good condition but some separation from the complete leather sweat band. Complete with unbroken chin strap and worsted ball minus its holder. Heavy loss of knap to sides of shell. The two gold bands suggest rank of Colonel or Lt. Colonel. Helmet plate appears original to the helmet. 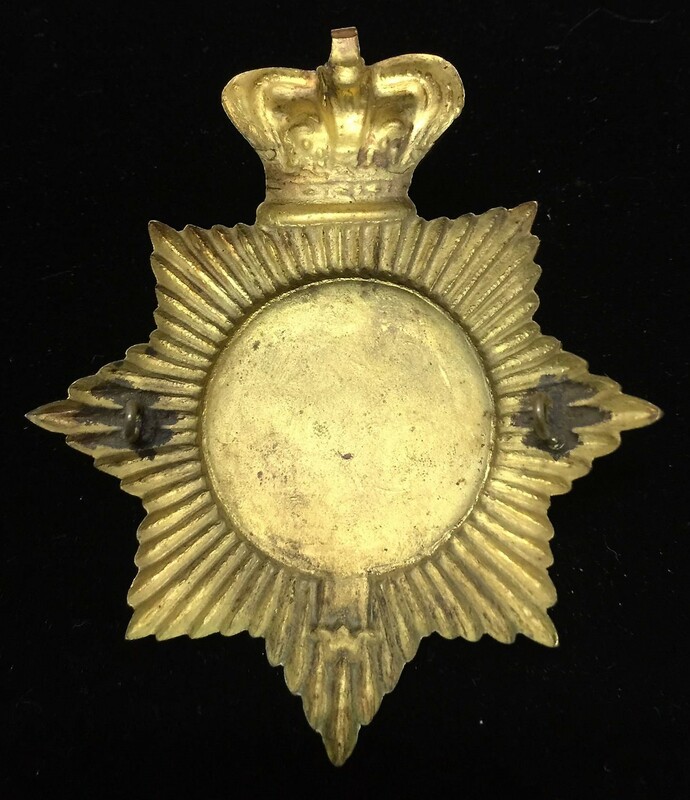 The stand out feature of this shako is the AUSTRALIAN MADE (probably STOKES) Helmet plate making it one of the earliest badges made in the colony. This plate is acknowledged among the advanced collectors in Australia and one was included on an old Stokes pattern board sold a number of years ago. 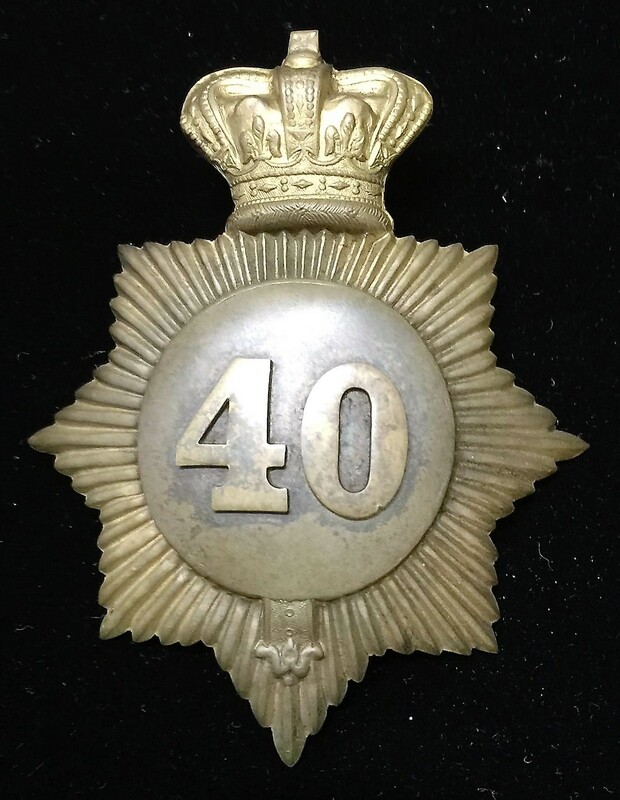 I am reluctant to clean this badge which shows some gilt particularly to the reverse suggesting Officers pattern which is in keeping with the helmet. The 40th Foot served a second time in Australia in 1852 and in October 1854 quelled an uprising at Eureka Stockade going on to serve in New Zealand 1860 to 1866 prior to the introduction of the 1869 Shako. The lack of motto and garter strap may indicate a late 1844 interim Officers Star shape plate prior to the issue of the 1855 shako and simply carried over. A good Victorian 12th Lancers cap complete. Helmet plate with Battle Honours, Peninsular, Waterloo, South Africa 1851.2.3 , Sebastopol & Central India. Two Lion head boss and velvet backed chin chain. The mortar board and skull still have superb finish although the yellow and blue band and red material show a few very minor nips. The internal liner and frame are in very good condition and there are two marks being W^D and 3 1900. Complete with plume holder and red plume with correct tongue which has lost a little colour. 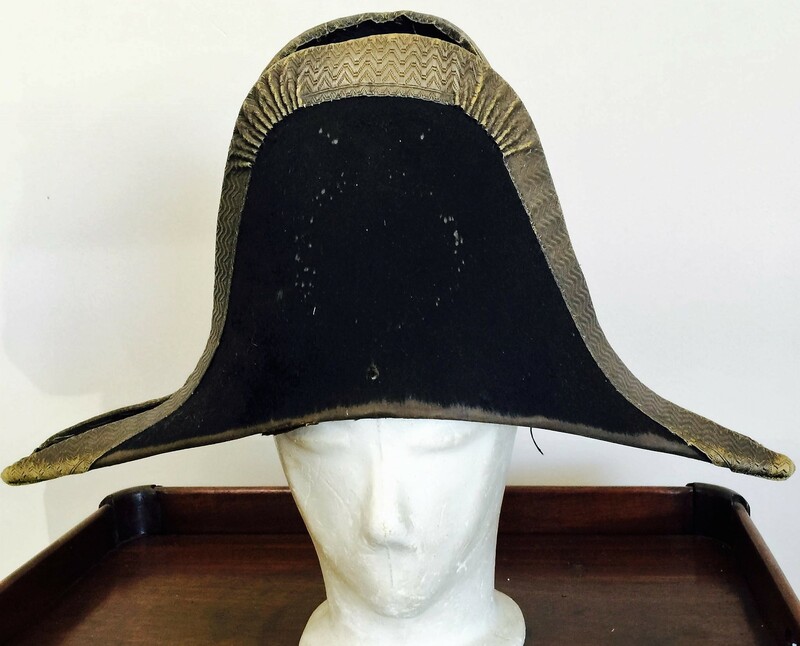 A scarce Napoleonic Bi-Corn General Officers hat. 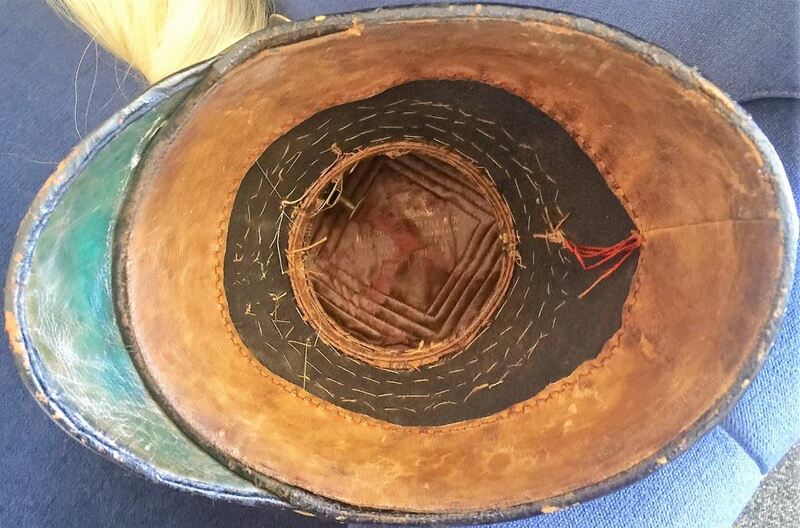 The bow in the liner would indicate this hat was worn shoulder to shoulder. 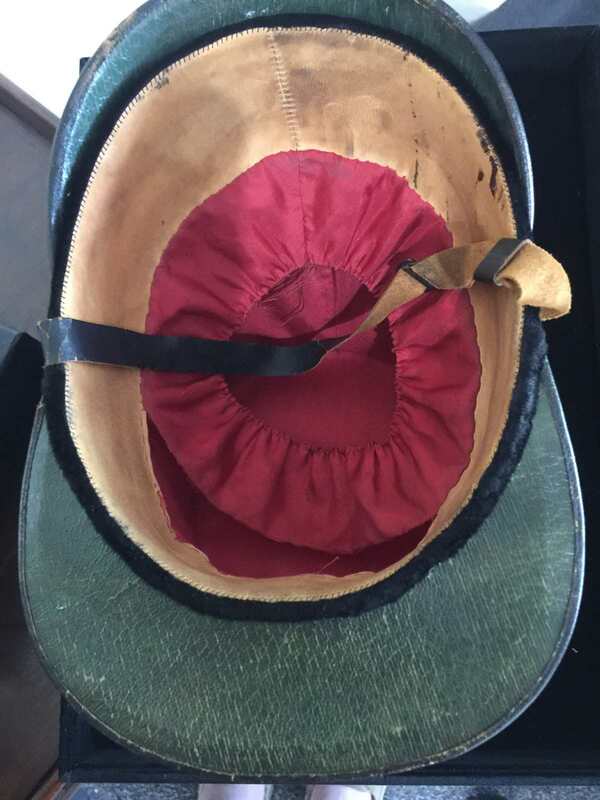 Unfortunately the large silk cockade and button are no longer present, but the liner shows good honest overall wear and is all present. 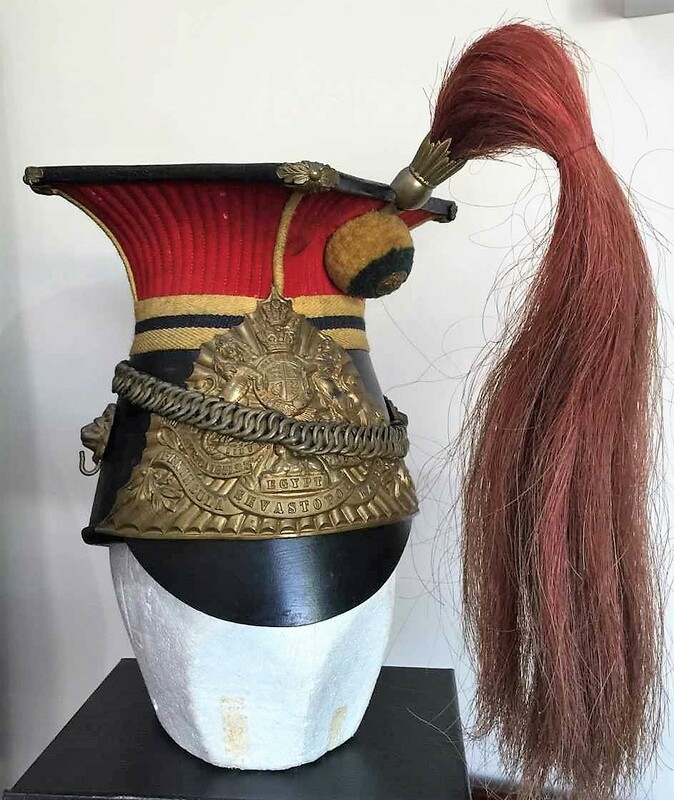 A superb example of the extremely rare Regency period Officers Shako of the 17th Light Dragoons pattern 1812. See plate 19 “Head dresses of the British Army” – Cavalry by W. Y. Carman (pictured above). The condition of this helmet is outstanding and possibly never worn. 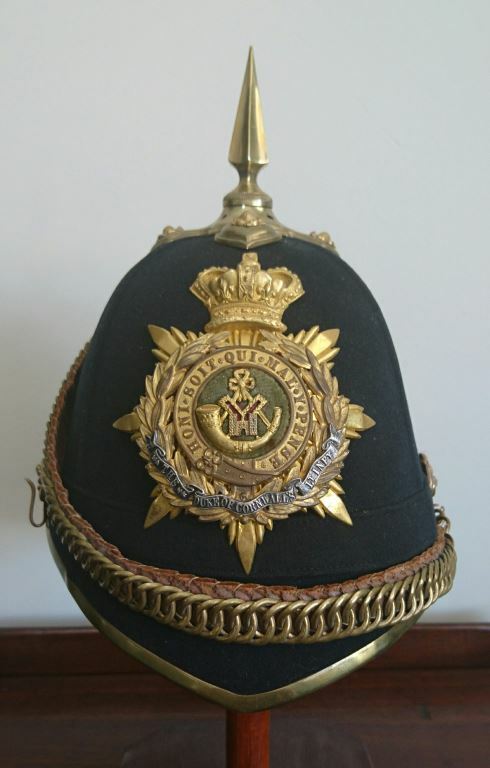 The Regiment history states “1812 .. the old helmet disappeared and the felt shako took its place”. After service in India from 1808 having landed in Calcutta with 790 strong, the regiment lost through disease, invalided and killed in action 26 Officers and 796 men but received numerous reinforcements during this period. It returned home with no less than 200 all ranks. On arriving in St. Helena in 1823 they learnt for the first time that they had been redesignated as a Lancer Regiment. 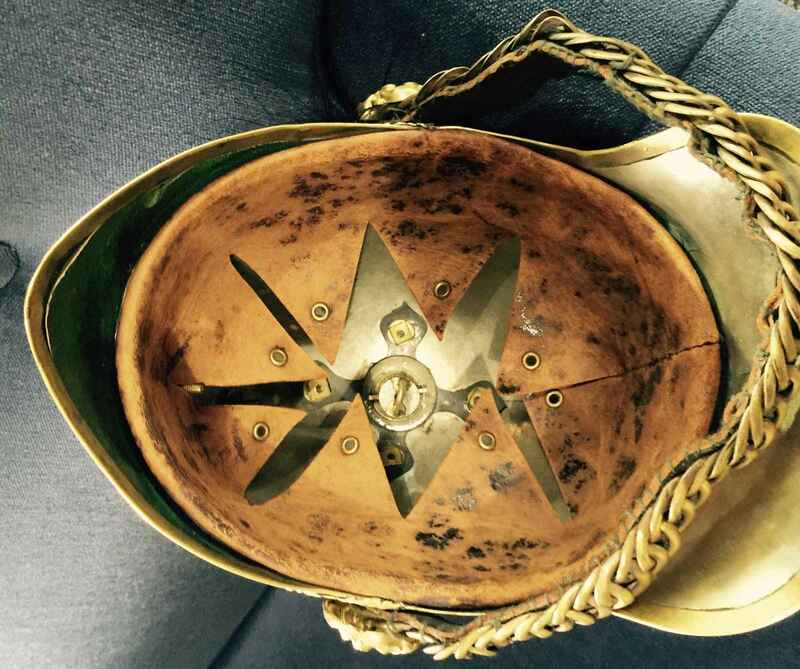 It is also recorded that “the shako was discarded forever and a lance cap of the more orthodox shape introduced in its place”. Close examination of this helmet shows almost no wear with even the complete chin strap in perfect condition. The maker’s placement of a Coat of Arms indicates a Scottish maker as the main Lion and Unicorn are reversed with first and fourth quarter of the shield depicting the Lion rampant of Scotland. 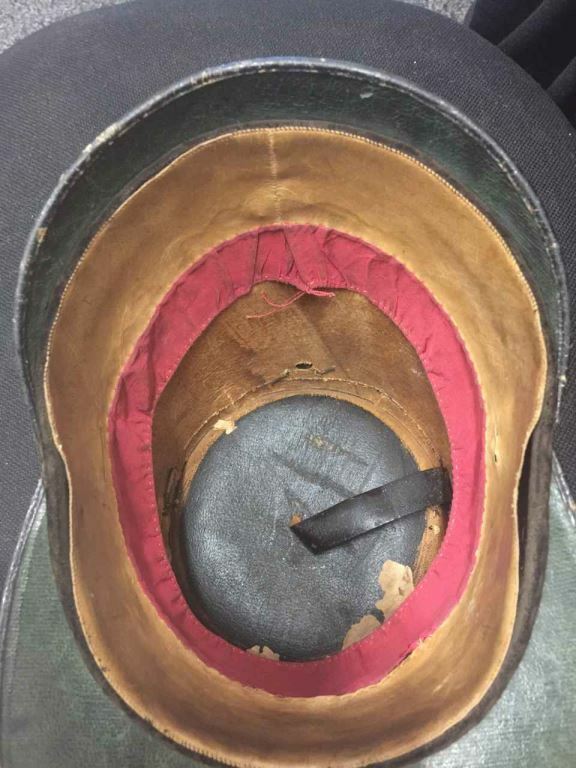 Being over 200 years old, Shakos of this quality virtually never survive. A truly magnificent example to an extremely popular regiment. 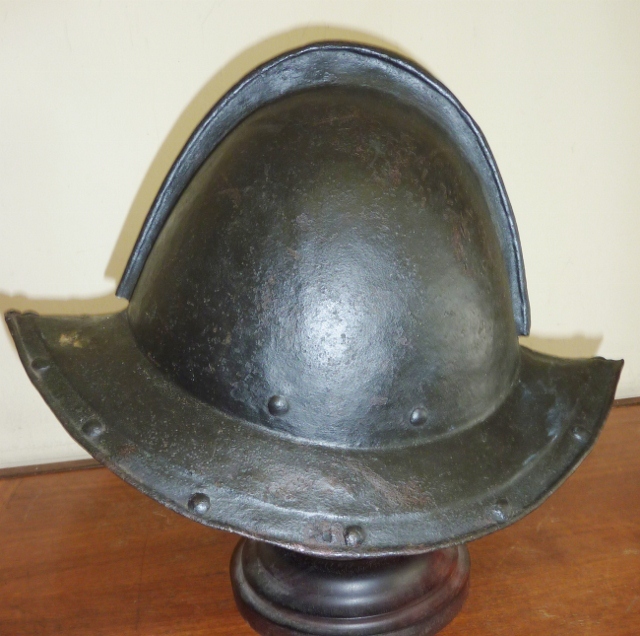 A very good Cromwellian Lobster Tail Helmet from the English Civil War 1642-1651. True in every respect for what you would expect from this period example. Four Lame fully articulated neck guard plus original nasal bar marked M (Nicholas Marshall?). Wing nut with good thread. Ear flap leather has been replaced at some time which is to be expected. 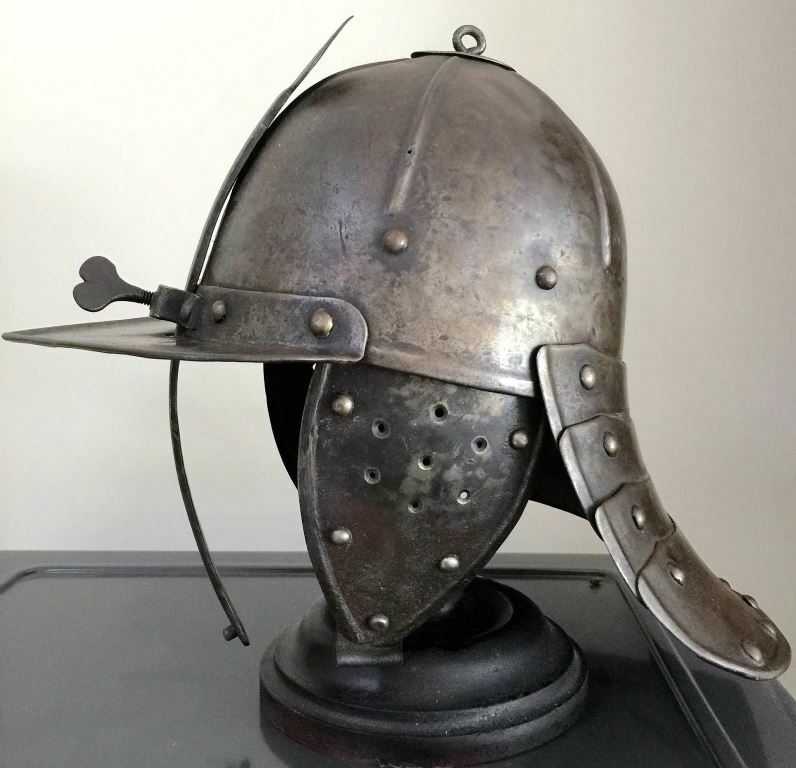 A truly lovely example of a helmet over 350 years old. 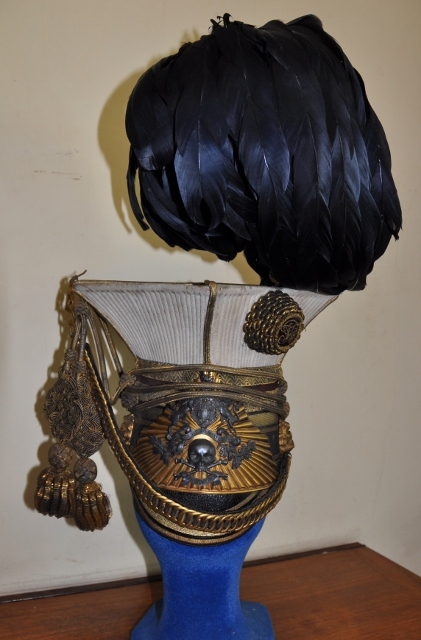 A good Victorian 17th Lancers cap complete. Helmet plate with 4 Crimea Battle Honours, Central India and South Africa 1879. Two Lion head boss and velvet backed chin chain (parting company with the scales towards one end). The mortar board and skull still have superb finish although the yellow and blue band show a couple of nips. The internal liner and frame are in very good condition and there are two marks being W^D and 3 years. Complete with plume holder and white plume with correct tongue which does appear somewhat long. 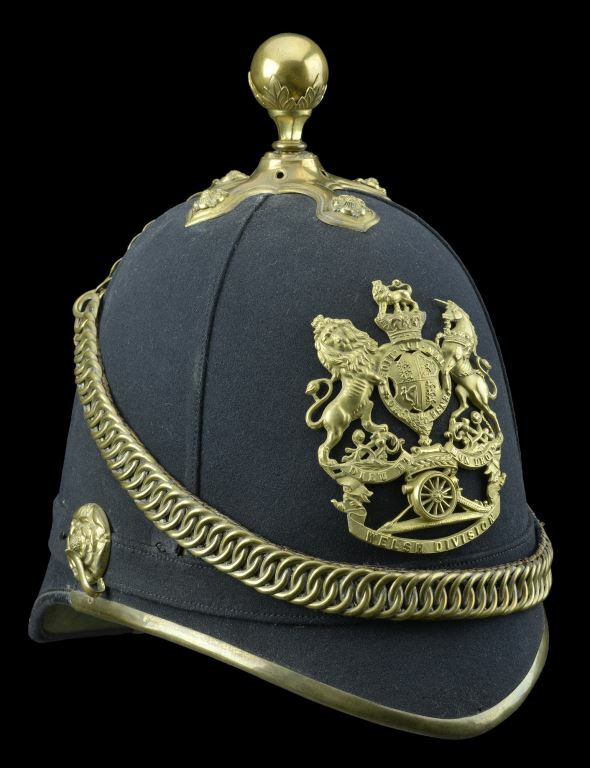 The North Staffordshire Regiment Officer’s Victorian Period Blue Cloth Helmet, the standard pattern blue cloth skull in good condition complete with correct pattern helmet plate (no evidence of any other plate being fitted), quadrant and spike polished down to the brass, with chin chain and original leather sweat band with attached crimson silk lining, some gilt loss to the helmet plate, front peak trim and spine. 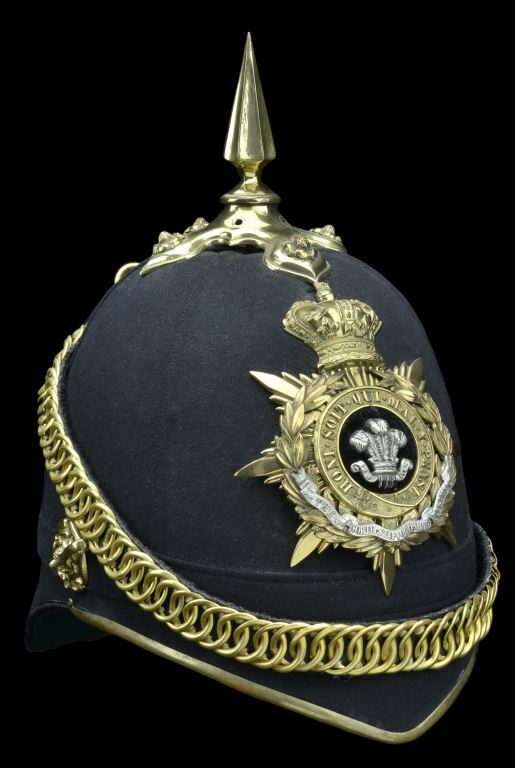 Duke of Cornwall’s Light Infantry Officer’s Helmet c. 1881 – 1901. Blue cloth skull complete with all gilt metal fittings, spike pattern finial, chin chain and spine. The helmet plate with crowned star back plate with laurel and Garter overlays, in the centre on a ground of green velvet a strung bugle horn with castle and red velvet feathers, one hook and two stud fasteners, the green velvet with fading, internally complete with original leather sweat band and silk lining in excellent condition. Overall condition is very good. 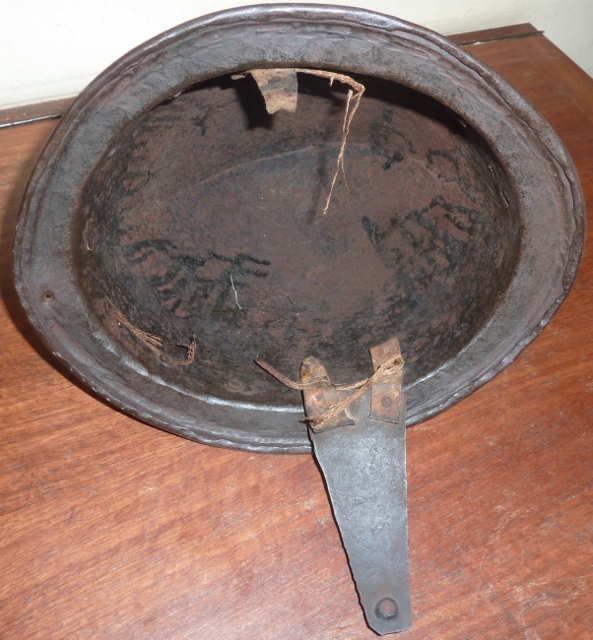 A English PIKEMANS POT circa 1650 formed in two halves joined by a turn over low comb. Broad down turned brim with all rivets present. Display holes to both ends of the points. Black tar type paint. CABASSET late 16th century. Typical form with short spike comb. One lining rivet missing at rear. What is particularly nice about this helmet is that it retains a single original ear flap with small part of liner (see photo). These ear flaps are never seen on these helmets. 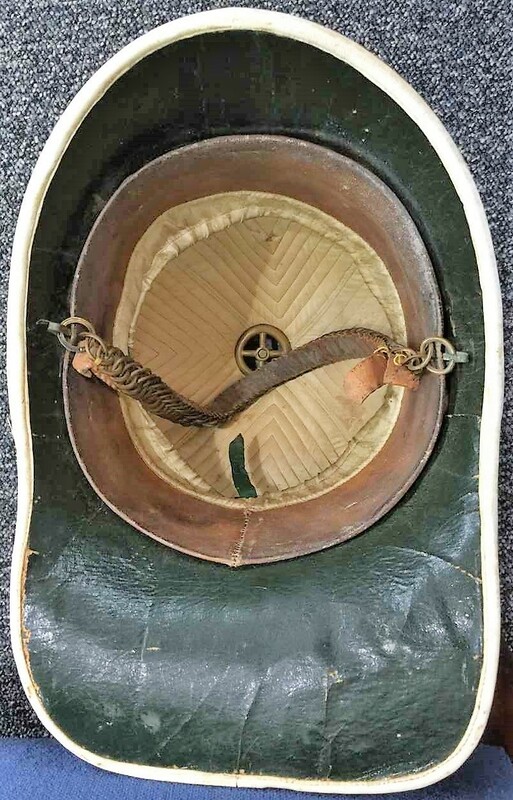 COLONIAL Pattern six panel pith helmet PRE FEDERATION STATE OF VICTORIA. Complete with quality gilt “double wreath” Victorian helmet plate with its two small lugs (close together) which indicates no other HP has been on this helmet. Gilt acanthus leaf base and ball fitting and lion head clip for chin chain retention. Complete with chin chain and corrugated sweat band base but missing the actual leather band which is something of a surprise given the quality of the rest of the helmet. 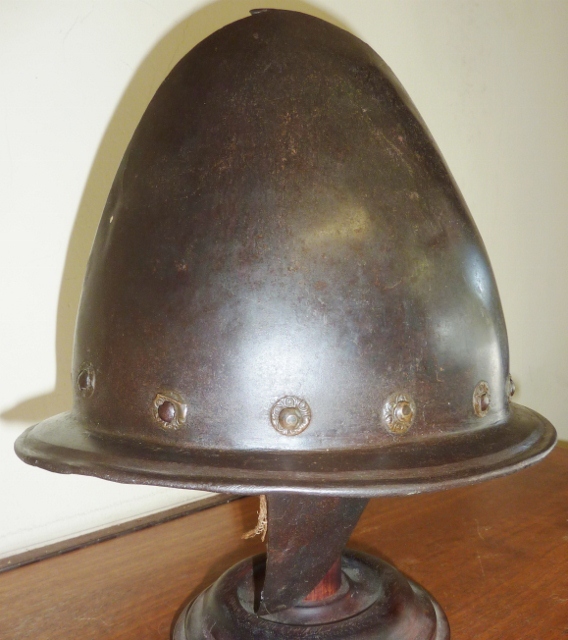 These early Australian helmets are now extremely scarce in good condition. A very scarce set of Turkish WW1 binoculars & Turkish marked binocular case by Carl Zeiss. 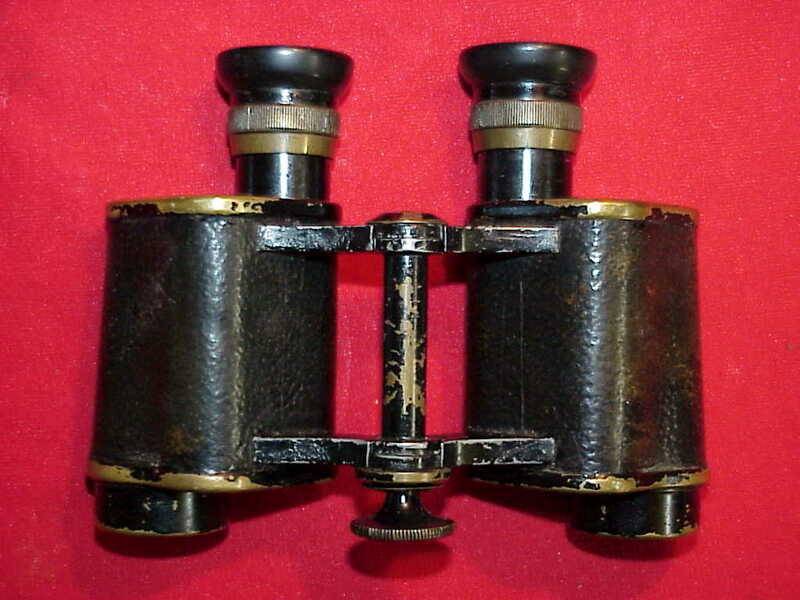 Binoculars are marked GOERZ MOD 1908 and are of excellent quality with very clear lens. 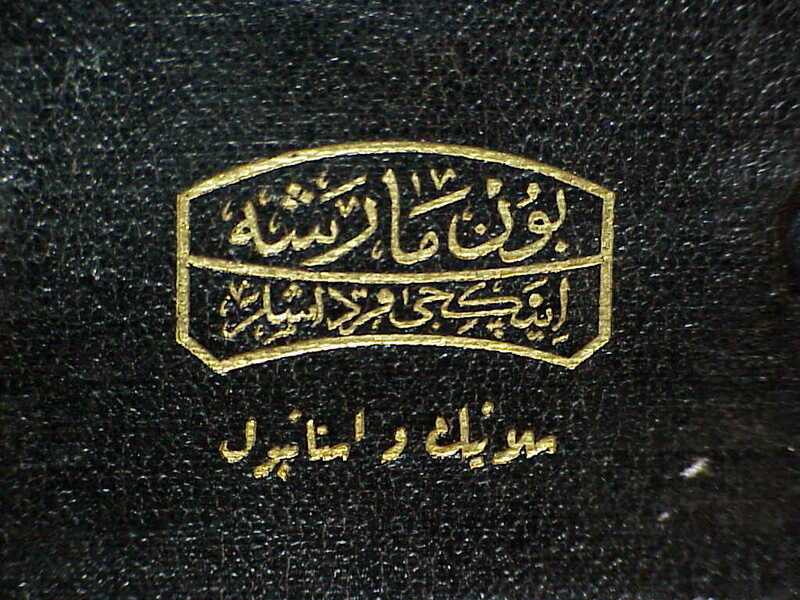 The leather case is text book marked as per the excellent ottoman uniforms website (ottoman-uniforms.com). Although German sets are fairly common, this is the first Turkish set I have had in 40 years. 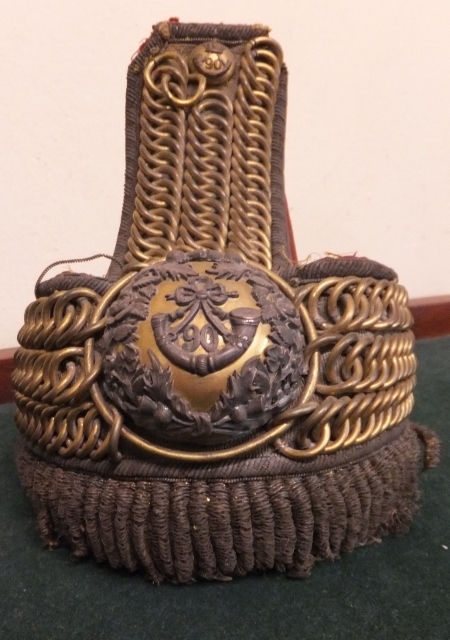 An extremely rare 1846 pattern 17th Lancers Officers Lance Cap. This example is in superb untouched condition with plume and from a very old established collection. It is even complete with cap lines, flounders and bullion tassels. 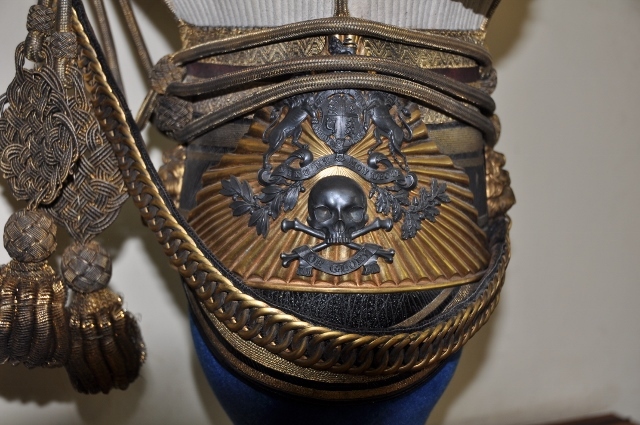 The helmet plate is true to pattern and is post Hanoverian coat of arms, yet pre the 1855 battle honours. Large lion head bosses and correct chin chain in excellent condition. Interior lining of black leather also in good condition. All in all, an exceptionally rare helmet of the Crimean period. 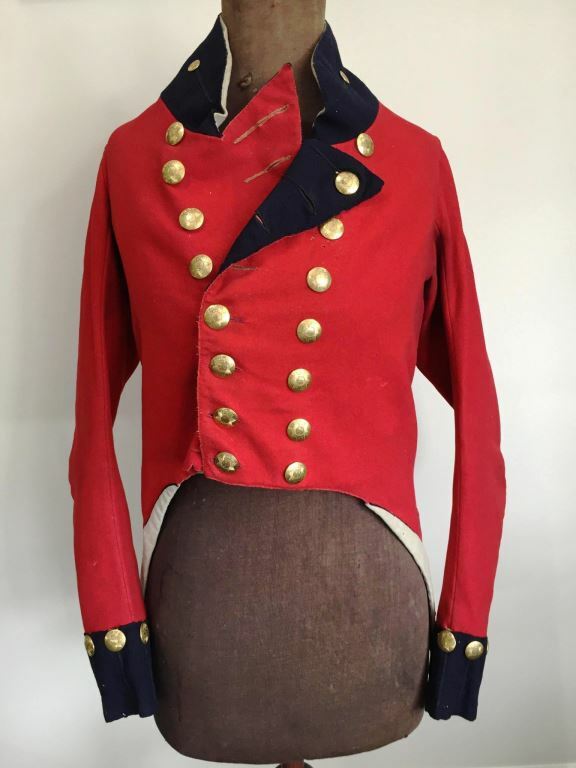 A superb pre federation state of Victoria local forces officers uniform circa 1890. Comprising lieutenants tunic, mess dress, waist coat. shoulder belt and pouch, waist belt and buckle and side cap with embroided badge. Profusely marked with Moubray, Rowan and Hicks Melbourne, even on the reverse of the buttons. 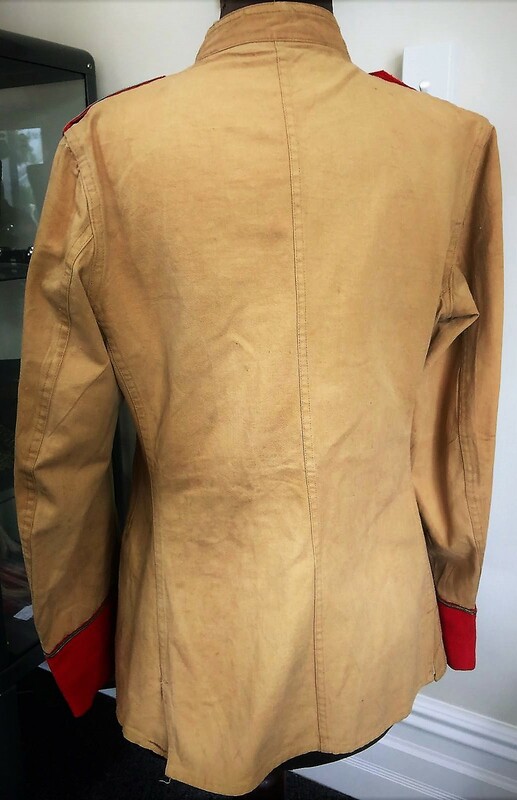 A rare Georgian Officers coatee in amazing condition circa 1810. Scartet cloth with dark blue facings, complete with all its gilt buttons (40) and gilt metal stringed bugles on the wings. Buttons back marked H T & D being Hammond Turner & Dixon 1800-1812. Some stain & moth under the armpits otherwise in outstanding condition. 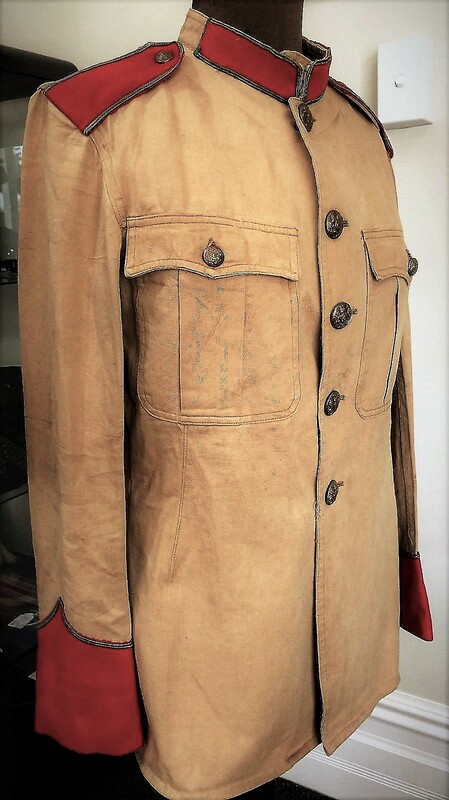 A Boer War period possibly Yeomanry Khaki Drill Tunic. 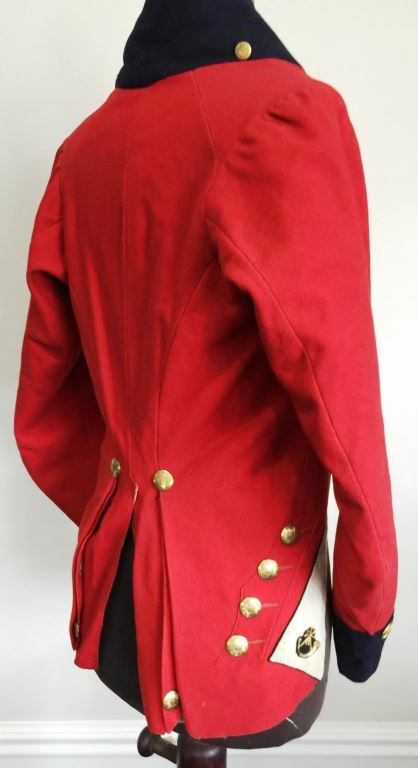 Five buttons with pleated breast pockets, red facings (collar, cuffs & shoulder straps), Buttons not sewn on as eyelets in place. Stand up collar suggests early Boer War. 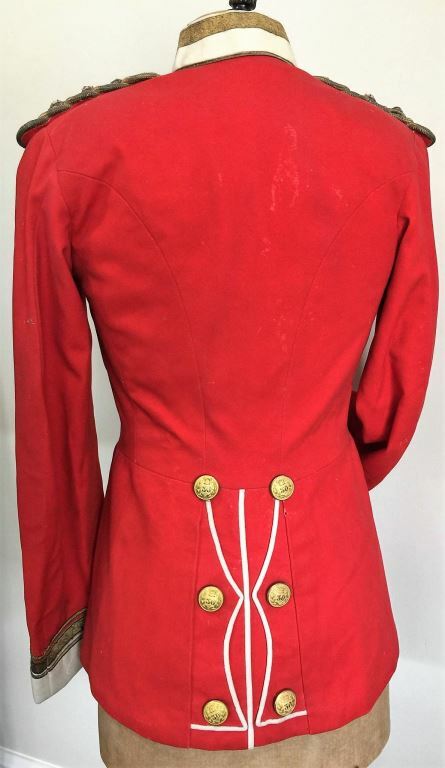 British Officers red tunic to the 30th Regiment, White facings and bullion insignia for a captain, gilt buttons with Victorian crown over 30 (Cambridgeshire). Making this an early tunic prior to becoming the East Lancashire Regiment. Sister Louisa Devenish Meares saw most of her service in Salonika with a brother (Charles Dycester Devenish Meares) serving with the 6th Light Horse. Possibly a gift from her brother or she could have been looking after the wounded from the 6th L.H (staying close to her brothers unit). Rare to find an Australian WW1 nurses attributed item. Further research could only enhance this interesting piece. 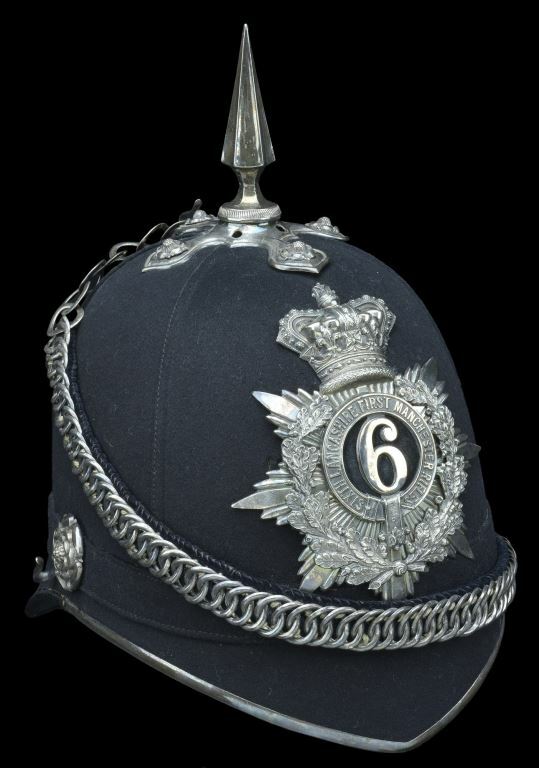 SECOND LIGHT HORSE 1930-42 full dress Wolseley Helmet, Typical seven pleat puggaree complete with acanthus leaf base and spike. Light Horse badge is original to the helmet with no extra holes and is further attached with fine cotton. Liner and leather sweatband in excellent condition with makers label J. Compton London. Complete with chin chain and japaned storage tin. Also included are a pair of original dog tags named to QX 6236 Captain R.A.G.Muir. This helmet was originally part of the well-known General Jess Australian collection. In very good condition. 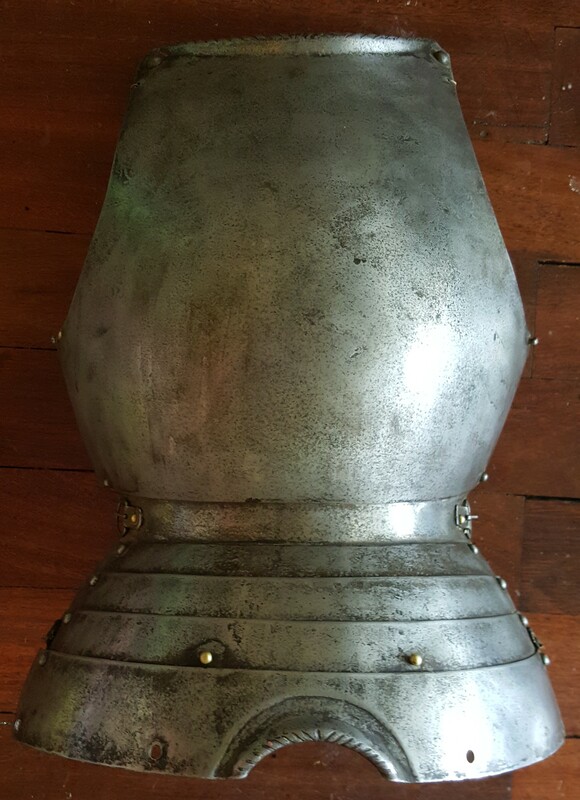 A Good example of a MORION circa 1600. Two piece skull with tall roped comb and turned over ribbed borders. All rivets present, Armourers mark close to forward point. One small hole in comb for display purposes. German M1916 Helmet "Sniper Brow Plate" or Stirnpanzer PLUS M16 WW1 German Helmet. Chin strap to helmet has a clean break but retains ALL furniture. Good Leather liner with 3 leather pockets (one empty) and one marked with owners name "P.Weihs". Front plate in good condition but strap broken with remnant of strap. This is totally new to the market with impeccable provenance having been found in the roof of a house being demolished and having never been in a collectors hands. World War 1 German pickelhaube reversible manoeuver helmet cover. Four correctly stitched eyelets with correct brass hooks for helmet retention. Spike top held by tabs to allow for ventelation. No tears or mothing. Very good condition. WW1 'Brodie' with extremely scarce Middle East cover (Mesopotamia). This cover is undoubtedly the rarest of all WW1 head dress items and is never seen. The dome and flap of cover is in extremely good condition however, there is some separation caused by the sharp edge of the helmet. Two extremely rare WW1 Cap tallys. First is to H.M.A.S. Sydney and the other is to S.M.S. Emden. These two Tallys were originally purchased in the 1960's in a Princess Mary chocolate tin from a junk shop, by a well known Australian collector. This collector acquired an original German WW1 "donald duck" cap in order to display the Emden tally. Both Tally's are in Superb condition and are not cut short. Extremely rare and significant items with excellent provenance. 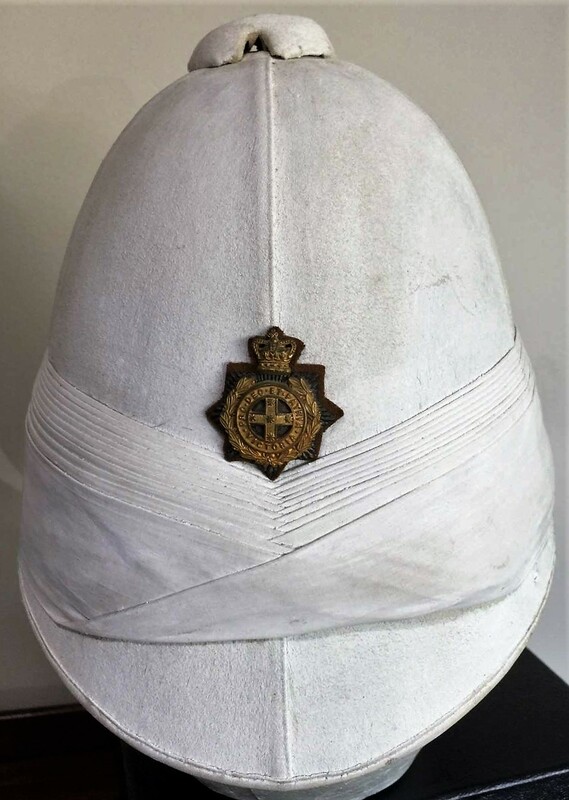 A Rare white Cloth State of Victoria Colonial 6 panel Pith Helmet complete with badge for the Victorian Military Forces which is original to the helmet. The badge is an Officers issue gilt on a silver star and is circa 1893. The elongated neck and body is still quite firm, with excellent puggaree. Good condition leather sweat band with sound silk attachment. Internal body has full quilting. Complete with leather lined chin chain. 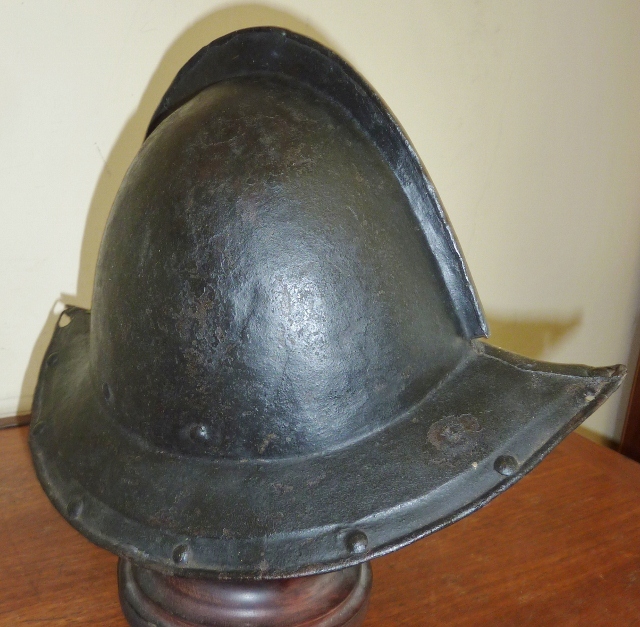 Colonial helmets are now considered extremely rare in this country and only seem to appear as a result of old collections being dispersed. Wurtenburg Artillery Other Ranks Issue Kratzchen. Maker Marked "Deutsche Industrie"
Main body of cap in superb condition. A few small wear spots, where liner is attached to main body. Otherwise in excellent condition. Prussian NCO Garde - Schutzen (Jager) Schirmmutze. Lovely condition, with superb liner. Remarkable given age. 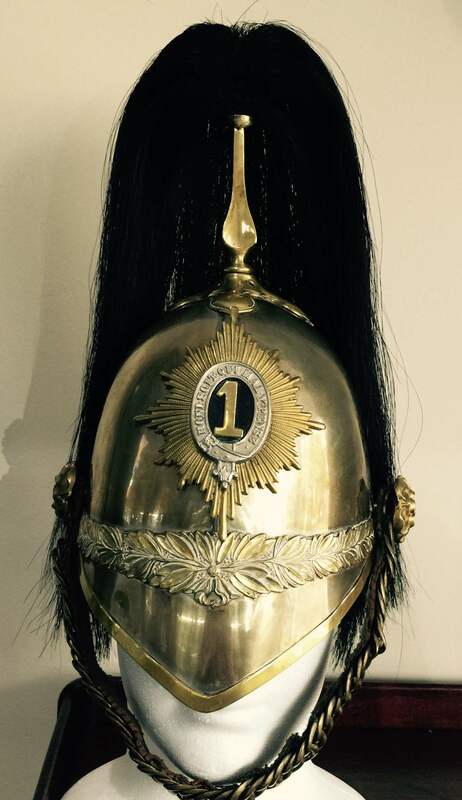 A very good example of an ORs Jager Zu Pferd lobster tailed cavalry helmet. Great makers plate on the inside "Nerm. Weissenburger Cannstatt" (doubles as washer to hold spike). 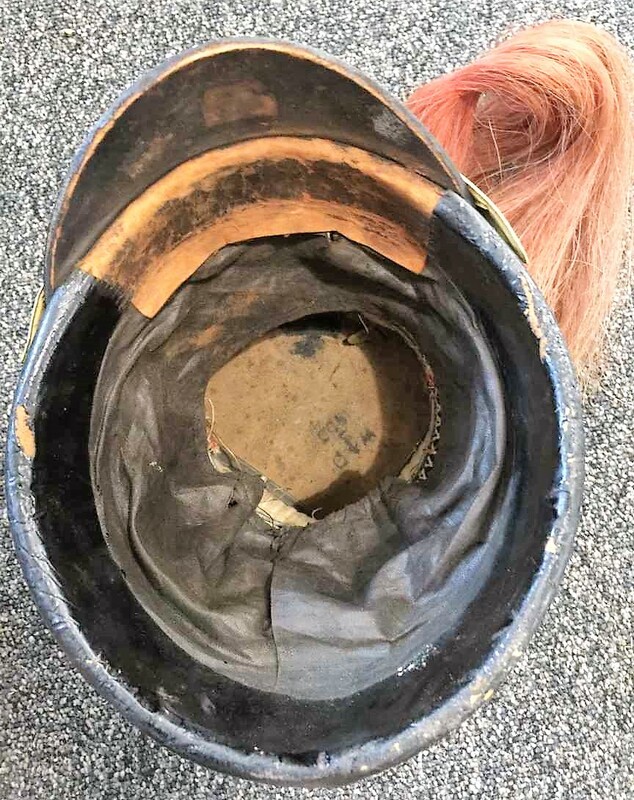 Body of helmet completely blacked including helmet plate. Complete with original chin strap and cocardes. Liner showing some wear, but complete. 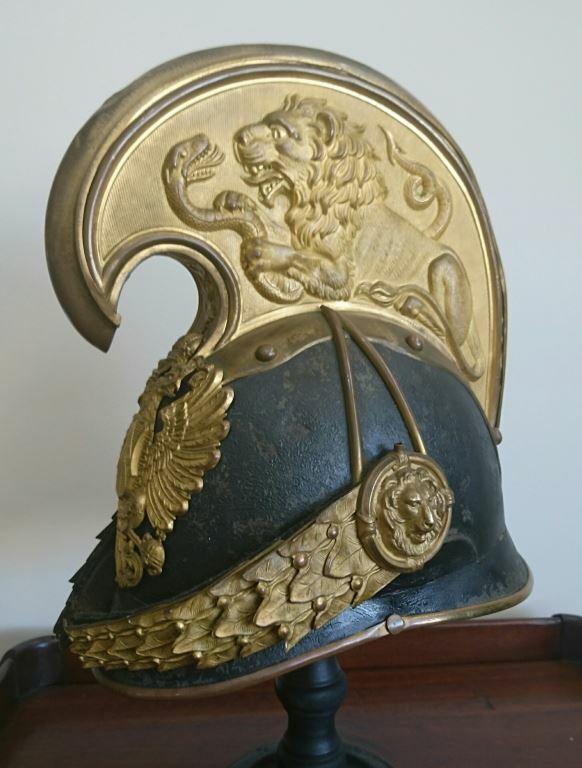 A great example of a Prussian OR's Kurassier Regt helmet. 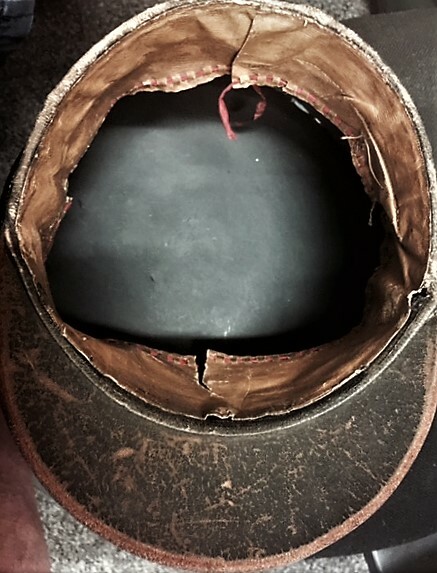 Maker stamped on inside "Otto Nachtigall Berlin 1915" (impressed on inside to main body of helmet at base of spike). Another cracking example of a lobster tail helmet complete with chinstrap, both cocardes and exceptional black leather liner. On the 31st of march in Afghanistan the 10th Hussars were involved in a tragic event crossing the Kabul river at Kala-i-Sak. Lt Harford, 46 N.C.O.s and men and thirteen horses were drowned in this disaster, which was subject of the famous poem by Rudyard Kipling. (below is a extract). By the ford o' Kabul river in the dark." During the 19 century, farriers were required to remove a hoof from deceased horses as proof of death thus avoiding any suggestion of "black market" selling of horses. BREASTPLATE, Early 16th century possibly German approx. 20 inches high. Roped border at neck and cod. Four articulated panels attached to main plate, complete with buckles.